Well that confirms why the numbers of ex N VLAs on the 123 has fallen to about 5-6. Probably not a surprise that B7TLs are heading to the scrap heap - the second hand market must be saturated with ex London vehicles plus some coming spare from other fleets. Given the non stop decline in UK bus routes and yet more cuts to tendered services there is no need for people to be buying second hand deckers any more except in penny numbers and even then they can pick the very best examples. The only small saving grace is that many have served a full London term of around 14-15 years and have probably been flogged to death in that time. To be honest I'm not surprised that these VLA's are being scraped for two reasons, Firstly most of these VLA's are in poor condition (Mechanically and Visually) and Secondly there is less demand for second hand buses as the last few years most operators were buying second hand buses mainly in order to comply with the DDA regulations. Many of those that are scrapped actually end up as parts, not uncommon for engine, batteries, wheels, axles, seats etc to end up in a container and shipped off to Africa where they get used in some locally built vehicle. They like simple big block engines, that are easy to maintain by guy with big spanner. No fancy emissions gear, or delicate electronics for their rough roads. 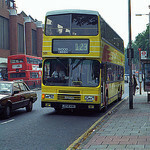 I wonder what's happened to the Norwood batch of VLA's that were on the 176? VLA109 had a fan mod and would never roar at GR, what the hell did EC do to it??? T82 & 83 are meant to replace these on the 690 at some point from what I hear - doesn’t matter to me as I’ve already snapped T83 on the 690 before lol. They were still on the forecourt at Norwood the last time I went past there, generally they're in good condition and I thought some of them might have gone to EC for the 123. Agreed. They have served their useful purpose and the materials should be re-used to create things for which there is a need. VLAs aren’t in bad condition, they’re the best buses at AR. I don’t smoke mate. In all honesty they’re still very sturdy, even more so than a lot of the newer HVs, I love the cab layout, and if you get a good one, it will leave everything in sight. All jest aside, it seems good VLAs are like hen's teeth and I was surprised they never took the opportunity to use the 04 plate VLAs or any of the ex 176 batch rather than buy 10 B9s and then store them... hopefully we will see them in action soon. EC are seeing even less VLAs each day, I'm seeing more HVs like 369 making their debut which would have been unheard of on the 123 before. There are just 5 VLAs out again, so they are fading fast, sadly. Sorry I'm a bit out of touch but Arriva London's acquiring some second-hand B9TLs?